A journey to a new world full of song and discovery. When faced with a new culture or visiting a n ew place, what do you bring with you? What do you leave behind? 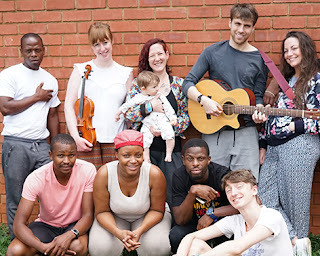 This international collaboration brings together original music intertwined with traditional South African and Geordie songs, verbatim testimony and storytelling. This World Here…Nomhlaba Le will take you on a journey exploring community and belonging, celebrating diversity and uncovering our unconscious biases. Asking...where is home? companies had an unforgettable ten days working together, most importantly they left knowing that they had to work together again, they had developed a mutual respect and fascination with each other’s processes of making theatre. The show has been developed through a series of international exchanges, originally commissioned as the flagship cultural project of Newcastles of the World supported by International Newcastle in 2016. This May the show will be staged at the Exchange in North Shields and Alphabetti Theatre in Newcastle. The two companies will run workshops with Mouthful Voices at Gosforth Civic Theatre who will perform a curtain raiser for the show on the 26th May at the Exchange. There will also be a workshop for year 5 and 6 pupils at Hotspur Primary School and visits to Hexham and North Tyneside Hospitals in partnership with the NHS Northumbria Healthcare Foundation Trust to share the songs and stories from the show with patients. The production has been edited and directed by Amy Golding who founded Curious Monkey in 2011. She has recently written and performed Preggers , which toured the UK in 2016 and has many directing credits to her name.